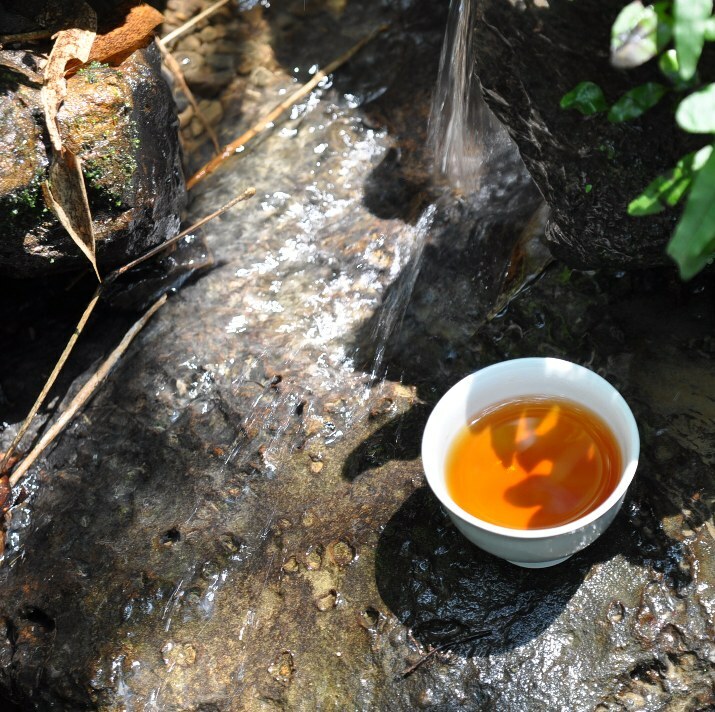 Spring 2012 High Mountain Oolongs! 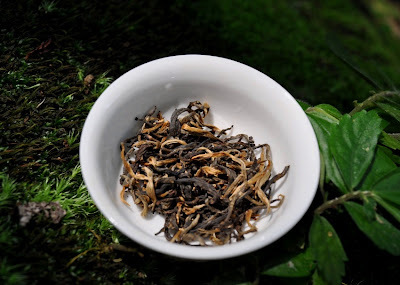 - Top Ali Shan Luanze Oolong (the most expensive Ali Shan). From Chang Shu Hu, it is on the light oxidation side and so powerful that it could be mistaken for a Da Yu Ling! A lively feeling of spring Alpes. 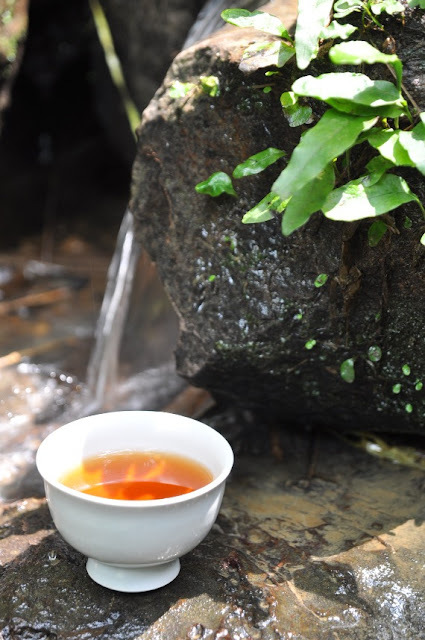 - Ali Shan Luanze Oolong, from Chang Shu Hu as well. Very direct and fruity. It is very close to last year's 1600 m Ali Shan. 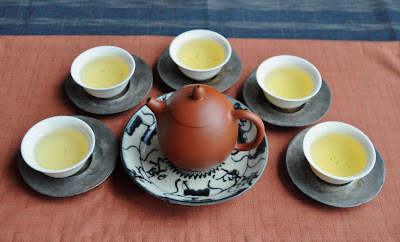 - Ali Shan Jinxuan Oolong. 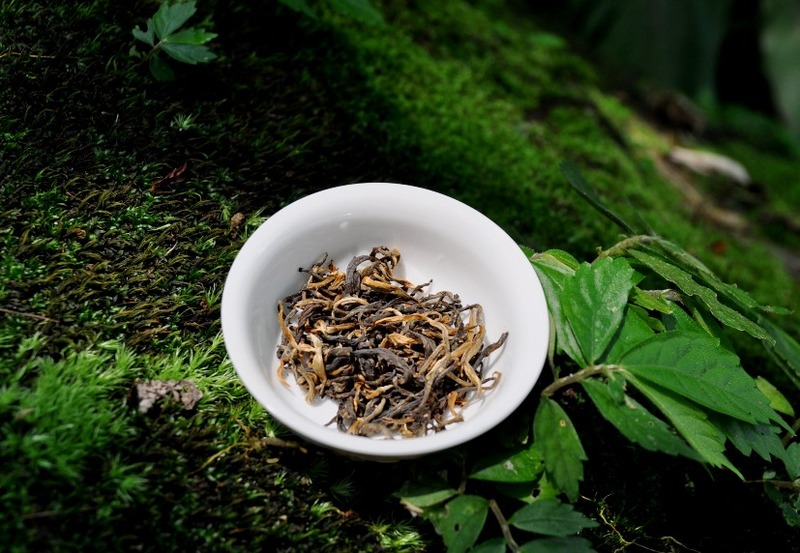 This light creamy Jinxuan feels less oxidized than last spring's Ali Shan Jinxuan.It's amazing how these huge leaves can be rolled so tight! 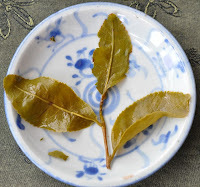 - a green tea from Wenshan, harvested on April 8, 2012. 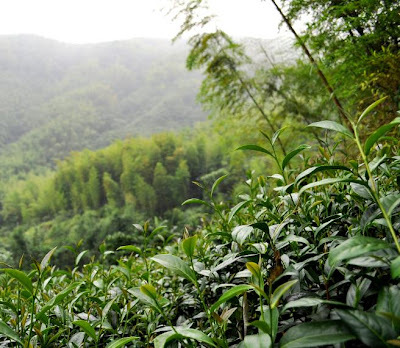 It is made with the luanze oolong varietal. I thought it's interesting to add it in my list, so that you can experience this popular cultivar as a green tea. - an organic concubine Oolong from Feng Huang (Dong Ding) made this winter. Here, the cultivar is also luanze (qingxin) Oolong, but the oxidation level is very close to complete (red tea). 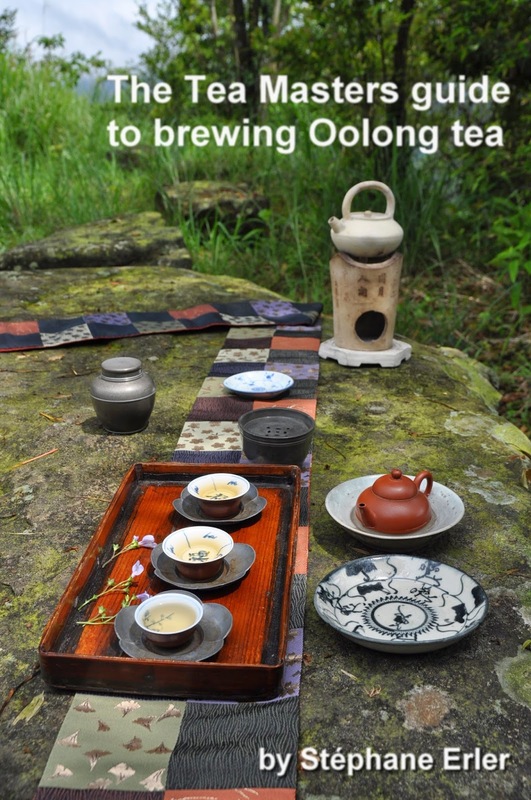 Its roasting is wonderfully done and the brew is as sweet as I ever experienced with a Taiwanese Oolong! And its endurance is outstanding too. 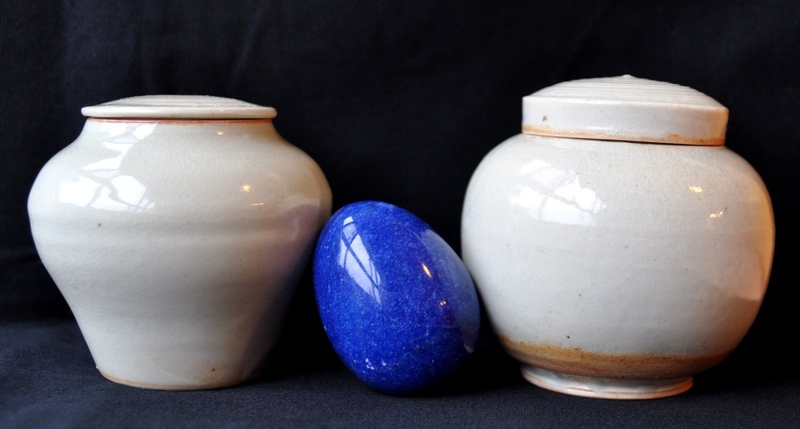 The Long Dan (Dragon Egg) shape dates back to the Qing dynasty. 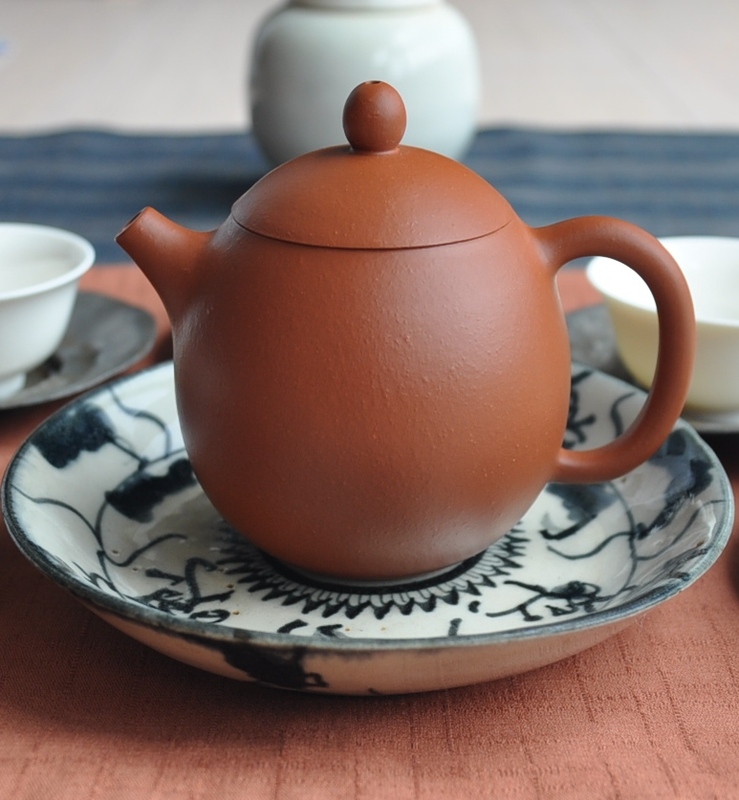 This new teapot achieves a good rendering of this style. I particularly like the knob. As I wrote before, it isn't just in harmony with the rest of the teapot (this one is also shaped like an egg), but it's very convenient to use. The spout and handle are discreet, which emphasizes the round shape of the body. 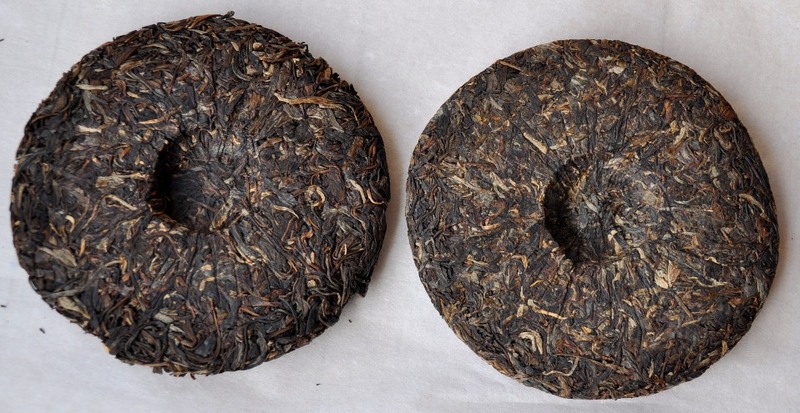 This shape is a good fit for rolled high mountain Oolongs. 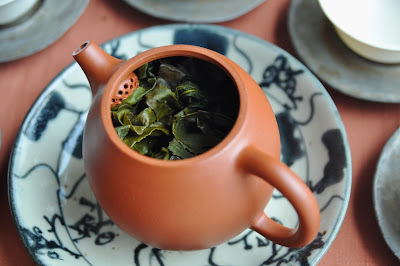 Inside, a golf ball shaped filter prevents the leaves of my summer Shan Lin Shi Oolong from obstructing the spout. This High Mountain Oolong tastes more fruity due to its summer harvest. Long brews tend to emphasize this character and add a note of bitterness. Gentle pouring of boiling water and shorter brews can make the tea much lighter and sweeter. 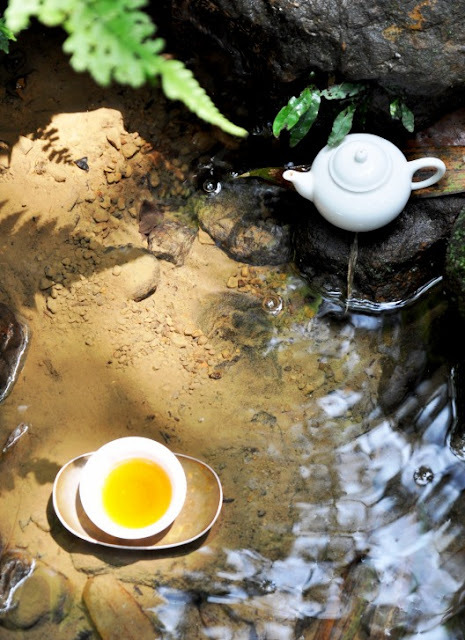 With such a tea, gongfu cha skills matter a lot. The lid doesn't close the teapot perfectly. When pressing on the hole on the knob, tea continues to come out of the teapot. I don't see this as a problem for using it, though. 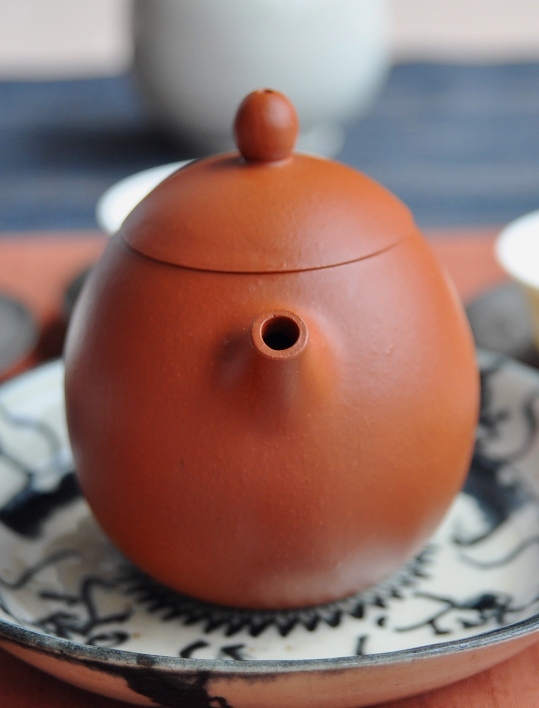 The sound of the teapot is high, which indicates a high temperature during firing. Delicate fragrances are not absorbed by the teapot, but they end up in your cup! Les thés verts du printemps sont d'excellents compagnons estivaux. Leurs infusions légères sont rafraichissantes et désaltérantes. Mais si l'on cherche à combiner chaleur et finesse printanière, je conseille mon Dian Hong sauvage (voir aussi le compte-rendu de Vacuité). Récolté en avril (2011), ses feuilles ont l'élégance et la fraicheur des premières récoltes de l'année. On remarque un grand nombre de petits 'poils' caractéristiques des bourgeons. Ceux-ci sont particulièrement longs, car ils proviennent de théiers anciens. 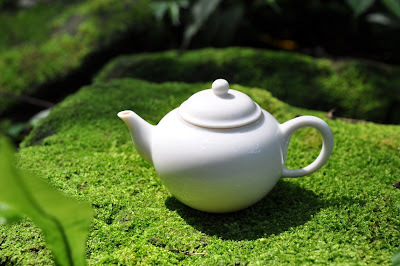 Cette petite théière en porcelaine qingbai (qui existe aussi en blanc ivoire) permet d'infuser ce thé de manière économique: quelques feuilles suffisent pour de nombreuses infusions. La porcelaine restitue particulièrement fidèlement les fragrances des thés rouges. L'infusion dorée est d'une limpidité cristalline. Cette pureté se retrouve aussi dans le goût, la sensation de bien-être dans la bouche. Une énergie puissante propage sa chaleur dans tout le corps (cette énergie, ce cha qi est particulière aux théiers sauvages à puerh ; mais elle a plus de chaleur grâce à l'oxydation totale des feuilles). Les odeurs fruitées sont entièrement naturelles et me transportent au plus profond d'une forêt dans la montagne ensoleillée. Volume: 6 cl (9 cl when filled to the top). 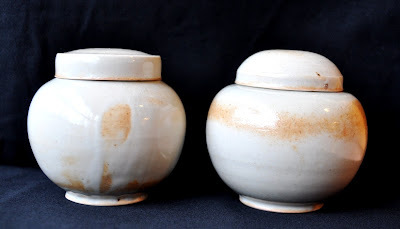 Porcelain with qingbai (light celadon) glaze. Handmade, Korean style, by David Louveau de la Guigneraye. 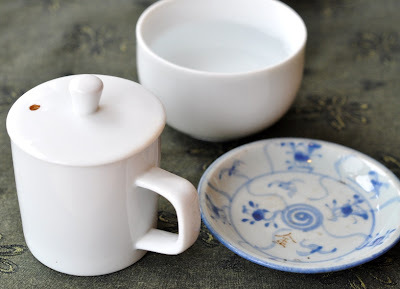 The qing (celadon) color echoes the green color of nature. 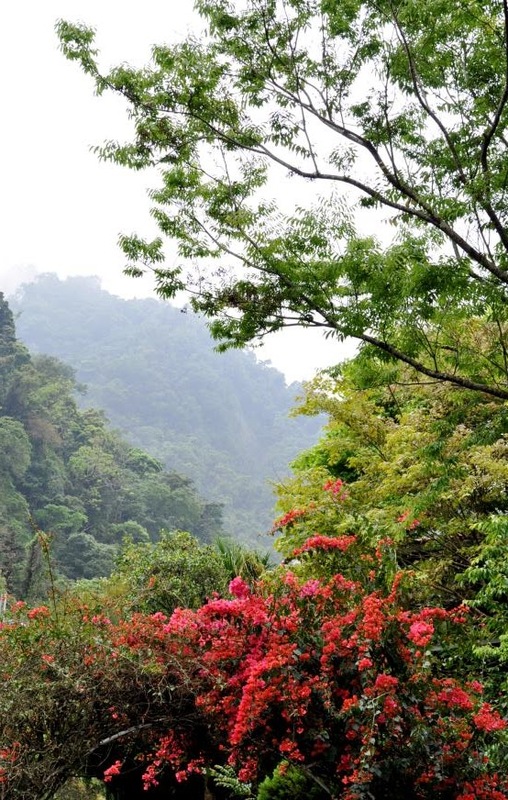 This color of spring and renewal is cherished by the Chinese. It explains why jade and celadon are so popular here. Their green color is particularly peaceful for our eyes and mind. 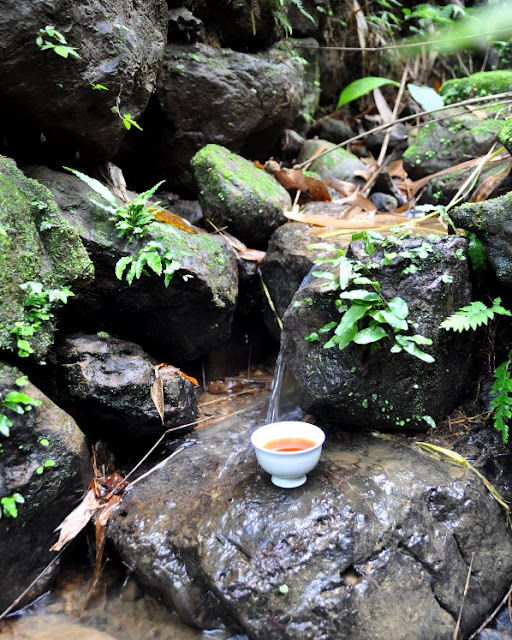 A good tea further transports us (virtually) in nature as we taste the flavors of the mountains it came from. This bigger cup fits a more relaxed style of brewing and drinking. It understands we don't always have time for very small cups. 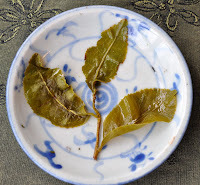 The qingbai glaze adds life and energy to the color of the brew (here my wild arbor Dian Hung). Beauty starts with the tea cup (says Teaparker's book title). And I couldn't agree more. The simple design of the foot, the curves of the body and the place for the lips: function and style combine with grace. 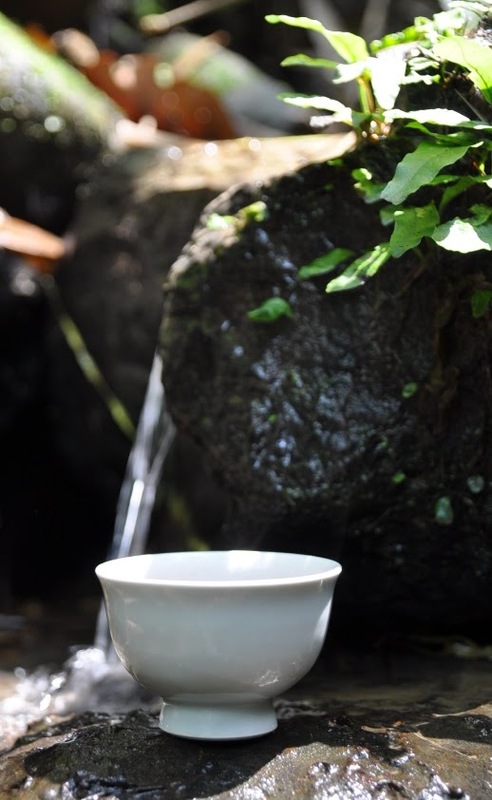 The cup creates a connection to the drinker and gives us so much (tea) pleasure! J'avais presque fini par perdre espoir, quand se produisit ce petit miracle pascal. En plus, tout est bien arrivé: aucune porcelaine ne fut endommagée par ce long voyage. Les jarres sont faites avec la même formule que pour la fournée précédente. Elles sont un peu plus grandes, et Petr m'en a fait quelques-unes avec une forme un peu différente (en haut à gauche). Sur certaines d'entre elles, les marques de la cuisson au bois sont plus marquées que sur d'autres. (Voir ci-dessous). 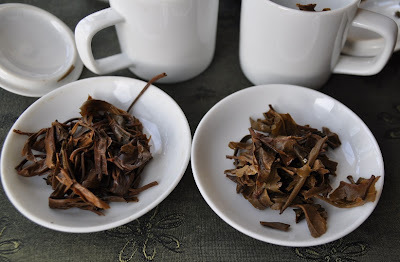 Du dernier lot, j'ai gardé une jarre que j'avais remplie d'Oolong d'automne non torréfié. Elle est maintenant au 3 quarts vide. J'ai pu constater que ce thé n'a pas perdu de sa fraicheur et n'a pas absorbé d'humidité. Cela, malgré le fait que le couvercle est simplement posé sur la jarre et n'est pas scellé. En plus, les odeurs qui s'en dégagent sont bien plus naturelles et fines que celles qui émanent d'un sachet en plastique. Hand harvested on March 27, 2012. Brewed competition style: 3 grams for 6 minutes in the white competition set. This spring's Zhu Shan Jinxuan harvest has benefited from perfect weather conditions. First, Taiwan had a long and cold winter that let nature rest and regenerate. While it rained sufficiently during winter (trees need water), the weather turned sunny, dry and cool during the harvest of this area. 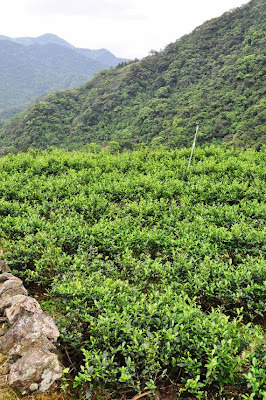 Such conditions are very close to those in high mountain areas and explain the high quality of this spring's crop. 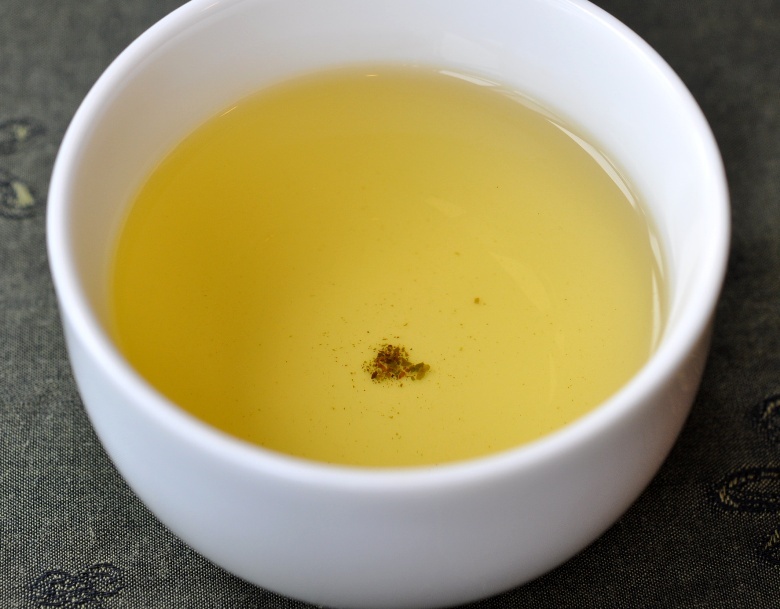 The light yellow brew has a wonderful clarity and shine. The taste is mellow with a light and fresh lingering sweetness. 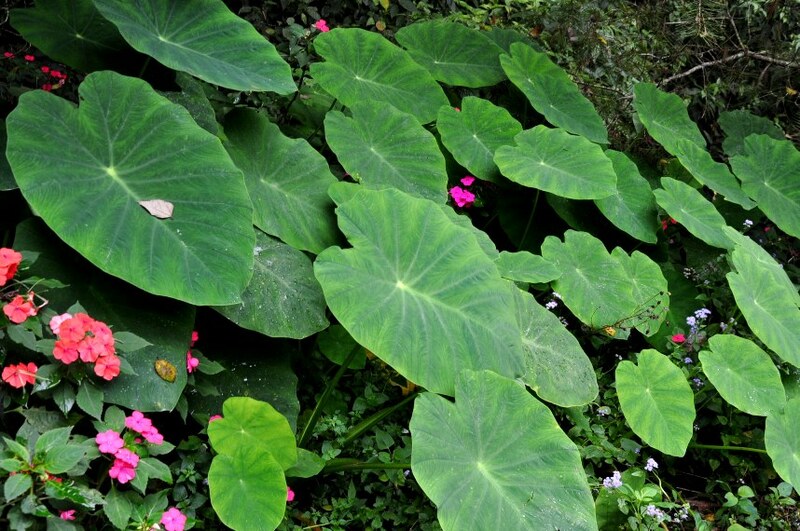 The natural, milky and flowery fragrance is soft and sweet. 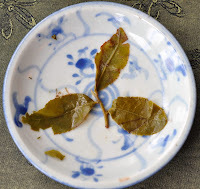 The oxidation is slightly stronger than on most Jinxuan (see the red edges of the open leaves below) and I have requested a second drying of the leaves to make the tea more stable. The result is an absence of bitterness and just a slight fruity astringency. On the top right, we can see that insects have attacked a tea leaf. This is always a good sign that shows that the farmer has minimized the use of pesticides. Quality starts with hand picked tea leaves from smaller plantations. The hand pick hurts the leaf the least. A whole leaf releases less astringency than a machine harvested leaf. 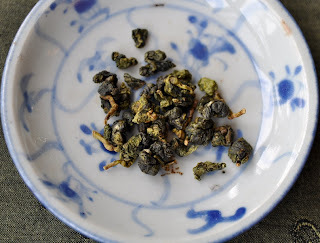 Conclusion: this batch of Zhu Shan Jinxuan Oolong tastes pure, sweet and fresh. It's an very good value for everyday drinkers of fragrant Oolong. This year, this is particularly the case! Ce rendez-vous aura lieu du 5 au 7 mai 2012 à Bruxelles. (L'entrée est payante pour les plus de 14 ans.) Après Paris, Penn State, Taipei, Strasbourg, La Borne, je me réjouis de venir participer à ce salon du thé pour y rencontrer mes (très nombreux) lecteurs de Belgique, de Hollande et du nord de la France. J'y aurai un petit espace pour préparer des Cha Xi. J'y donnerai aussi une conférence le dimanche 6 mai. J'ai pensé au thème de la conservation et de la bonification du thé. Si vous avez d'autres idées de sujet qui vous semble plus prioritaire ou adapté à cette occasion (et ce public), vous pouvez me laissez un commentaire. Cerise sur le gâteau, Teaparker (mon tea master) sera aussi présent avec une conférence (en anglais) le samedi 5 mai! 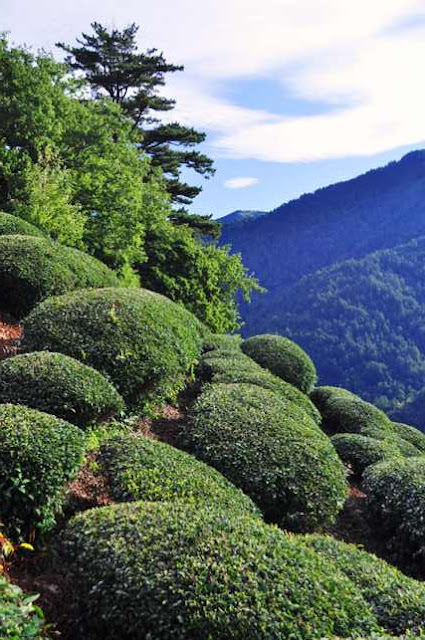 Les Oolongs de haute montagne ne manqueront pas non plus! Recently, I could repurchase my favorite Spring 2006 wild, old arbor Lincang raw puerh cake. It had been in my selection for a while and I kept a few cakes for my own pleasure. This provides a good opportunity to compare the storage in my apartment (in northern Taiwan) with the professional storage in a dedicated puerh warehouse (in Taiwan). First, guess which cake comes from where? The cake on the left looks darker and isn't as tightly pressed as the cake on the right. This is the cake from my home! I had kept it in its tong, in a carton, on top of a closet in a sleeping room where we use the air conditioning the least in summer. In terms of smells, my home stored cake has a slightly darker, wood like scent, but also weaker fragrances. The warehouse cake has a much more energetic, pungent, flowery scent. It is much more 'attractive' and sweet. I brew both cakes side by side, using the same weight (3 grams). The brew of my cake is a little bit darker. But what strikes me much more is the color of the leaves: the warehouse stored leaves are still very green, while my leaves are darker and much more red! This means that my cake partially oxidized during its storage. 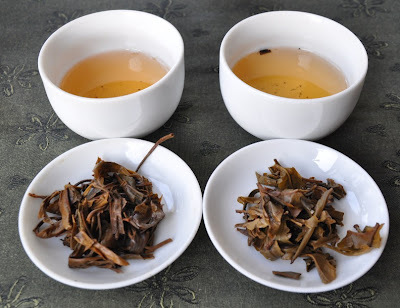 In terms of taste, there are lots of similarities that confirm that these are the same puerh. (I started to have my doubts after all these differences!). Also, the taste tended to become more and more similar as I made more brews. But the taste of the warehouse stored leaves has more energy overall. In the first brews it had more depth and balance. What is good aging of puerh? From this experience, I conclude that oxidation of the leaves (darker leaves) isn't necessarily a good sign of aging. What is the difference between my home storage and the warehouse storage? My puerh occupies a small space in the room, while in a warehouse, the tea is stored in a much bigger quantity. Also, such warehouse keeps its doors shut most of the time. There is less air and airflow. Another difference is the presence of old raw puerh in the warehouse, while I stored all my old puerh in another room. (This is going to change...) The inoculation of the young puerh with bacteria from older leaves probably also helped to improve the young puerh. Despite the leaves looking greener, it didn't feel/taste younger than the darker leaves from my storage. 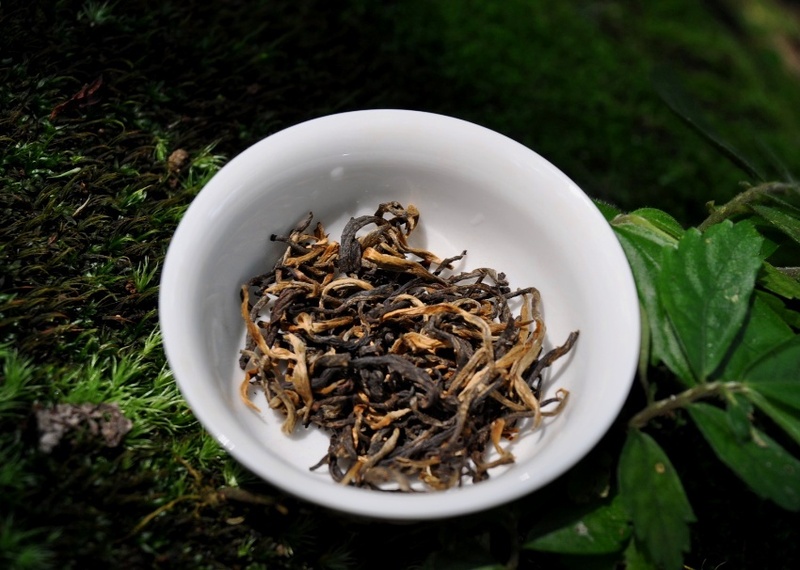 The outstanding quality of this raw puerh can be seen in the clear, transparent and shiny brew. It is amazing how pure and powerful its taste can be. Despite the competition style brew (3 grams for 6 minutes), the mouth remains perfectly clean. 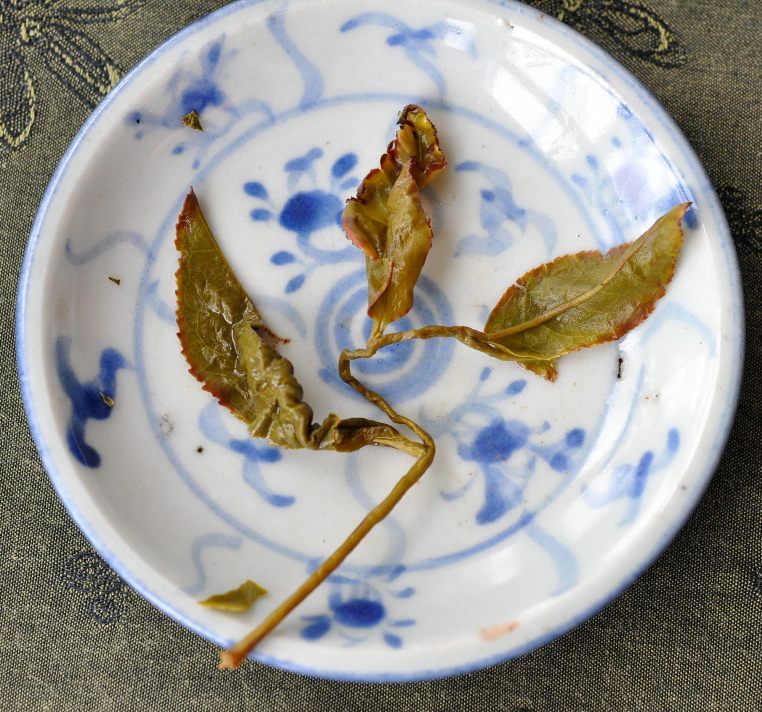 All that remains is an extremely refined and powerful cha qi and never-ending aftertaste. It's so amazing, it has a scent of rose when brewed well! The expression 'teamaster' takes a new meaning with these leaves: the tea is the master! You learn how to define and measure quality with such a tea. Purity, energy, clean feeling, sweetness, warmth... It has it all. 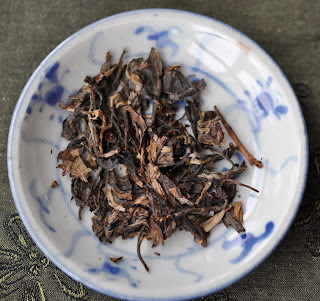 This raw puerh sets the bar very, very high. The best education comes from the study of the classics (*). These spring, high elevation, old arbor, wild puerh leaves are a masterpiece of puerh. I'm very glad that I can add this (warehouse stored) cake to my selection again. 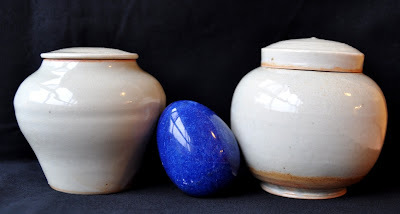 (*) The best motivation to learn is also to enjoy the 'material'! "Les carnets de la maison morte" (Editions Babel) sont le récit des années de bagne en Sibérie que Dostoïevski a personnellement vécues (autour de 1850-60). "Entre autres, ils m'ont appris qu'il fallait avoir son thé, et qu'il ne faisait pas de mal de posséder une théière" (page 56). Ce livre parle bien plus souvent de vodka et des beuveries auxquels se livraient certains prisonniers ayant accumulé assez d'argent pour tout claquer en fois. L'alcool est la boisson des excès et de la violence dans ce bagne. Le thé, lui, est mentionné ici assez rapidement, mais dans ce 'fallait' on peut lire à quel point le thé était indispensable pour tenir le coup dans cette prison de Sibérie.
" - T'as vu, chez lui, il avait sa soupe maigre dans son auge, et là, il prend du thé ; il veut de la boisson des maîtres, dit le détenu taciturne." (page 70). 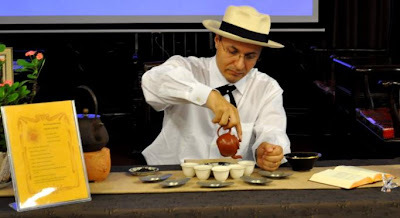 - "Ce n'est pas le thé, a répondu le Polonais. Ils vous en veulent parce que vous êtes nobles et que vous ne leur ressemblez pas." (page 71). Le narrateur se fait engueuler pour le thé qu'il prend. Mais ce n'est qu'un prétexte. 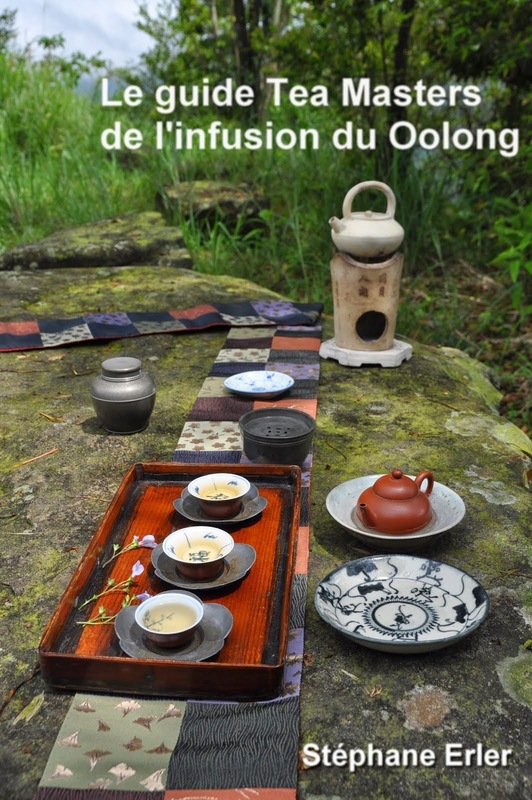 Pour les autres détenus, le thé est le symbole de l'orgine noble de ce détenu. Ce passage nous rappelle qu'au 19ème siècle, le thé est une boisson chère et élitaire, bue par les nobles, les "maîtres". Le thé en sachet ou les feuilles produites mécaniquement en masse aujourd'hui font qu'on a tendance à oublier combien le thé a longtemps été un produit de luxe. Dans ce bagne, on voit aussi que les prisonniers les plus communs sont ceux qui préfèrent les excès de l'alcool, alors que ce sont les (nobles) mieux éduqués qui boivent le thé. C'est du thé compressé qui entrait au bagne! Le thé parvenait en Sibérie par voie terrestre, à dos de chameau. Aussi, il était compressé, pour faciliter le transport. Une grande partie provenait du Sichuan. C'est aussi pour cela que les thés exportés autrefois étaient des récoltes de bourgeons, très concentrés, et donc de faible volume, mais à forte valeur. De nos jours, le coût du transport a baissé avec l'essor des échanges mondiaux. Il n'est plus besoin de compresser le thé!